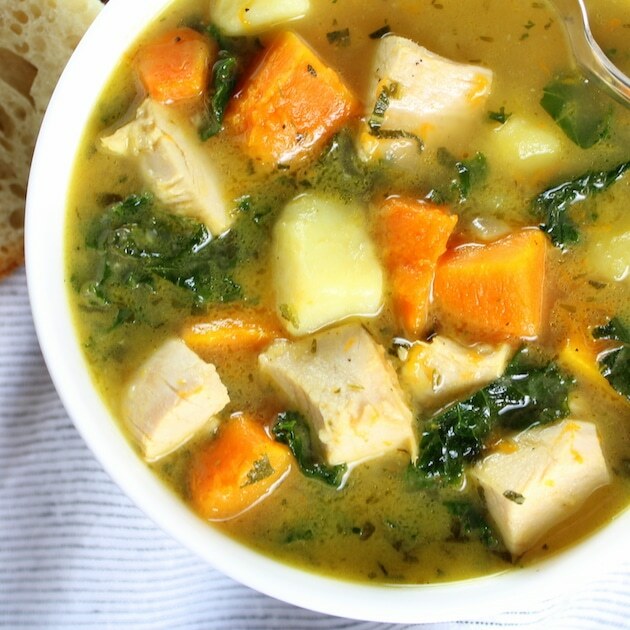 Kale and Butternut Squash Turkey Soup – hearty, healthy and absolutely delicious! 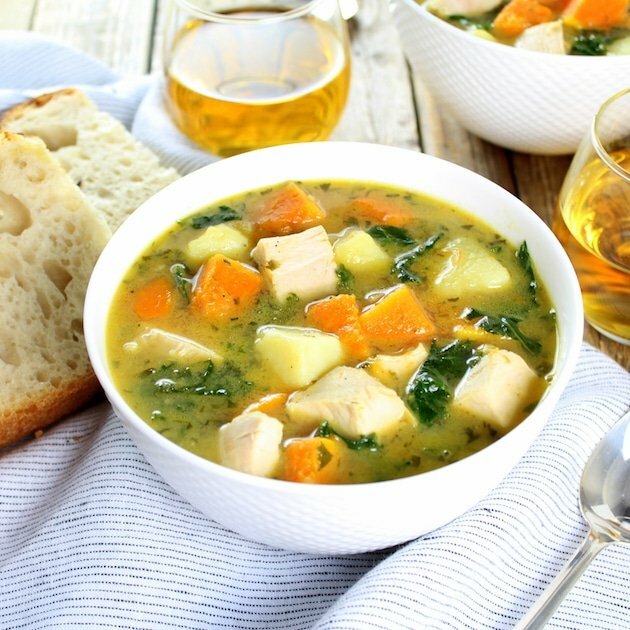 With homemade stock, butternut squash, potatoes, kale, turkey, sage and thyme, it’s an easy and healthy dinner that will satisfy all winter long. Well the big food event is behind us. At least it’s behind most of us. Our Thanksgiving meal will be prepared on Sunday this year. See we have this tradition of flying down to Florida to see the B man’s parents on Thanksgiving Day, then celebrating Turkey day on Friday. This year our flight was late in the evening, so we postponed our eating frenzy until Sunday. I mean no need to rush things, and I want to be good and rested so I can genuinely experience my turkey coma (none of this jetlag mucking up the works)! I must admit I’ve already had plenty of carbs, and turkey for that matter this season. You may have noticed my Classic Turkey Stuffing and the Closed Oven Turkey on the blog earlier this week? Yep – I’ve been cooking my heart out over here. But it doesn’t really count as “Thanksgiving” unless all the yummy festive food is made and served at the same time – right??? That’s what I thought, so for me and my house Thanksgiving is on Sunday. But less about me and more about you… You’ve probably been stuffing your face with apple pie and pumpkin rolls for days. And it’s probably got you feeling a little, well, stuffed? Shake it off, or maybe walk it off, my friend. We’ve just entered high volume Christmas cookie, Holiday appetizer, and festive celebratory meal season. Woohoo!! Bring on the brie!! It might be time to get out those joggers with the elastic waist band, ‘cause we’ve got four more weeks to go. And why not enjoy it? Soon it will be January and we’ll all be at the gym every day, and munching on carrot sticks and kale leaves. But what’s a girl to eat right now? Hmm let’s think about this: you most likely have an enormous amount of turkey in your refrigerator, AND you’re probably interested in something on the lighter side? I know – why not make this hearty turkey squash and kale soup!?? 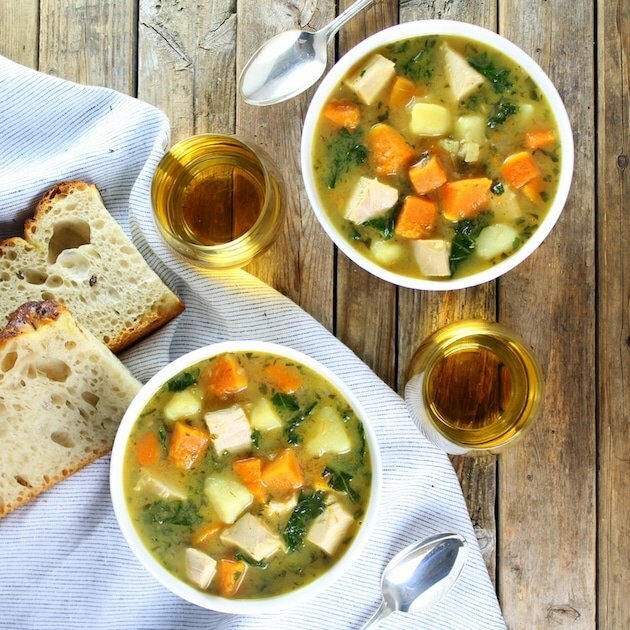 It’s not only healthy, it’s absolutely delicious! I saved my turkey carcass and made a huge pot of turkey stock, so that’s what I used for the base of my soup. 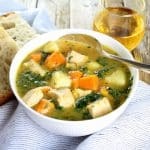 But you can also use store-bought turkey or chicken stock. I roasted some butternut squash in a little olive oil, salt and pepper. Then chopped up some onions, celery, garlic, fresh sage and thyme and sautéed them in a soup pot of the stove. I added my stock to the veggies and let it come up to a simmer. Then I dropped in 1½ pounds of cubed Yukon potaotes, let them cook for 10 minutes, and added in the squash. 5 more minutes on medium high heat and then in went the cooked cubed leftover turkey and 4 cups of chopped kale. 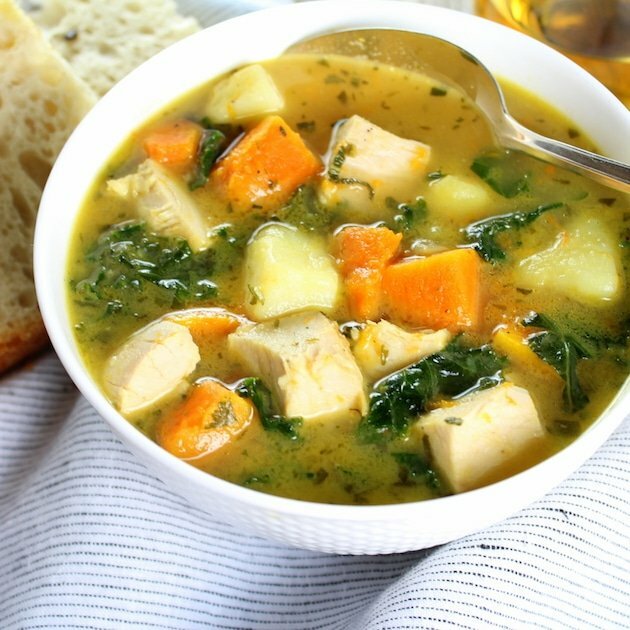 A gentle stir, take it off the heat, let the flavors marry for about 5 minutes… and enjoy! 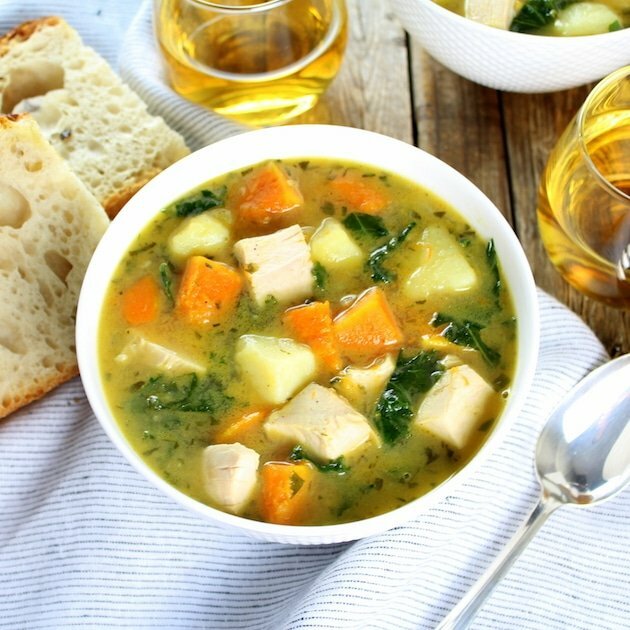 The potatoes give off some starch when they cook, which gives the soup some nice body and a silky creaminess. 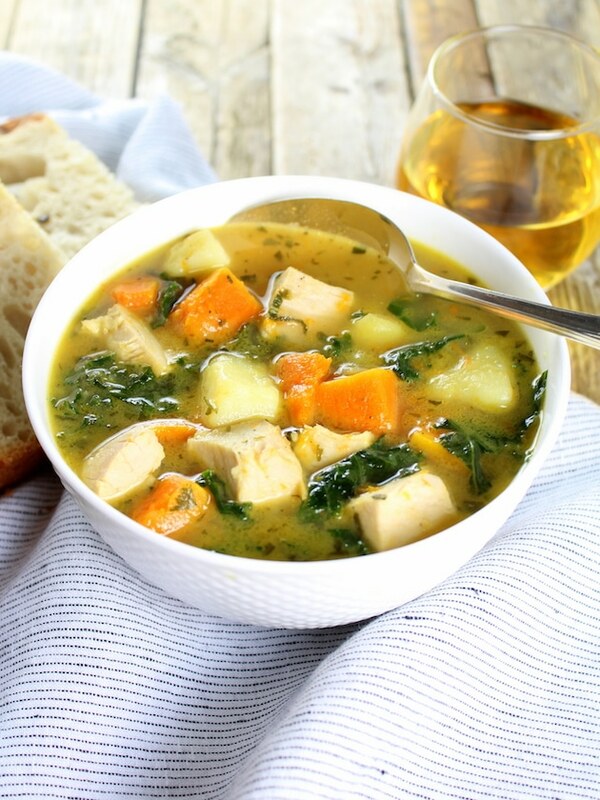 The butternut squash adds a hint of buttery sweetness and the kale give it some nice hearty texture. 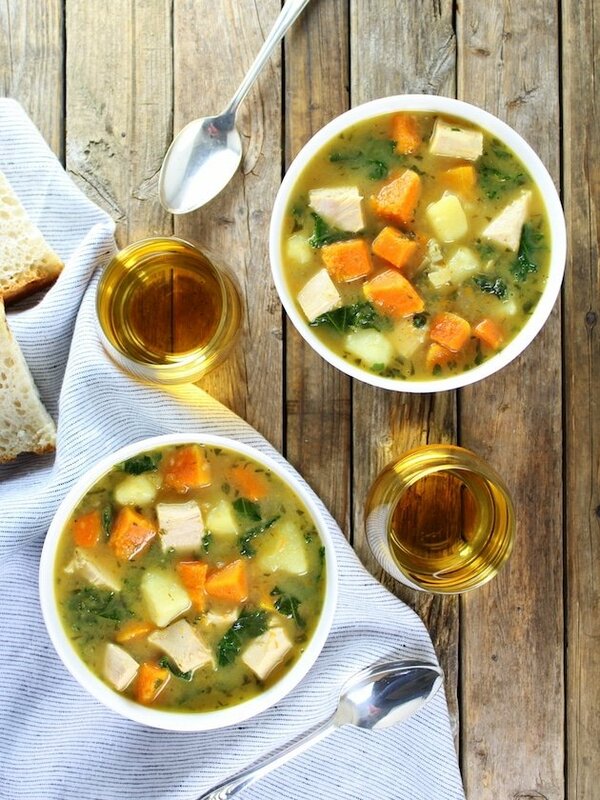 Kale and Butternut Squash Turkey Soup – hearty, healthy and so delicious! 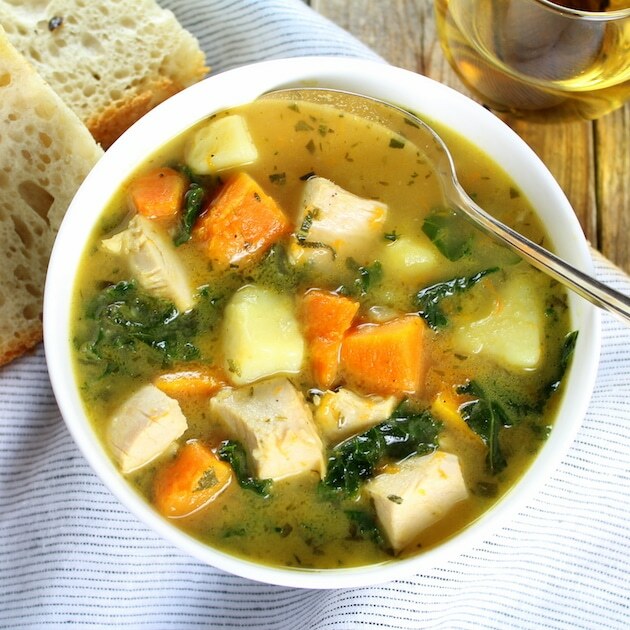 Satisfying, hearty and healthy soup with Turkey, potatoes, butternut squash, and kale. 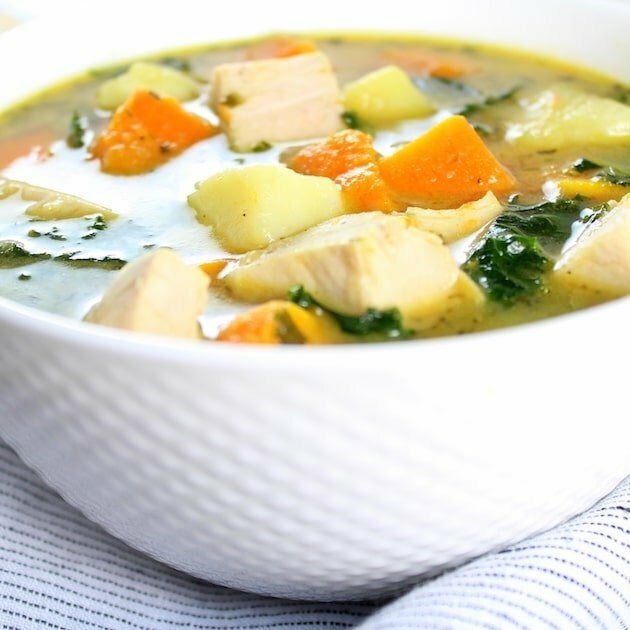 Add 1½ pounds of cubed Yukon potaotes, and simmer for 10-12 minutes. You can also substitute the cooked turkey meat for roaster chicken meat or ground turkey sausage (fully cooked). 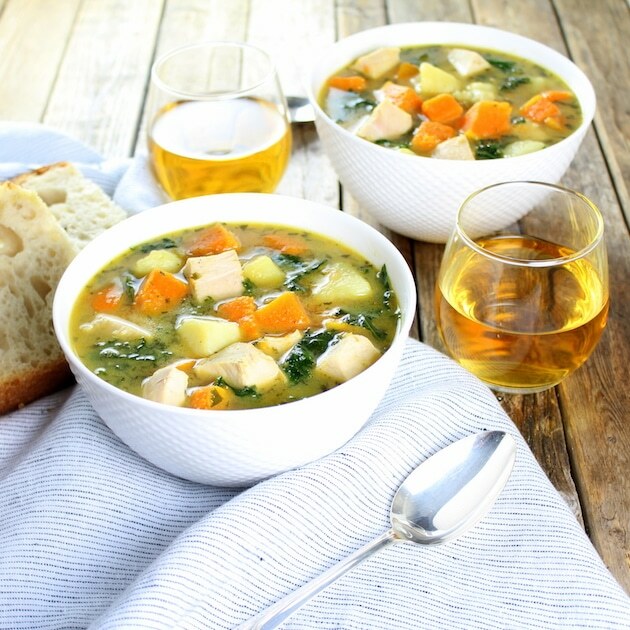 Looking for more hearty healthy soup recipes? Might give this a try. Love your pics.